A popular site for finding eBook torrents for free. At Ebookee, you can check Recently Viewed eBook Torrents, Top10 eBook Torrents, Latest Added eBook Torrents and much more. "So I wanted to the find the best places to download The Buddha in Me, The Buddha in You. I wanted to read so I downloaded Ebookee so I could download the book I wanted! Worked great." "If you are trying to find a place to torrent Star Wars eBooks, I would check out Ebookee. It is a good site for finding eBook torrents for free." "I love comics and wanted to find a new website to download them. I found Ebookee, which is a torrent site for books and comics. Although they have a lot available there, they didn't have any of the comics I like. These are popular comics, too, so I was surprised by the lack of selection. The user interface is also not intuitive and a lot of torrents don't have enough seeds to make anything worth it. Find something else, if you can. There are much better torrent sites out there." "Loving Ebookee, it's the one stop E-book site that provides all your needs, love it. " "I enjoy using Ebookee to see all of my favorite comics. It almost always has what I am looking for and it is easy to access. I have downloaded old and new comics here and not had any problems. Ebookee is my go to when I need new reading material." "Ebookee is okay. They do claim to have free and legal books to download. But they use websites like rapidshare to upload the books. If you've ever used rapidshare, you know how frustrating this can be." "I can across this site the other day. It has a lot of material and gives you an easy way to download and enjoy the material. " "I REALLY LIKE Ebookee BECAUSE IT'S FREE! Also this torrent site definitely has a lot of audiobooks to offer. Wasn't even expecting at first that they have Doctor Who!" "I love a good book just as much as the next bookworm but I'm also a very busy young lady so I can't always sit and read for hours, so ebooks are the next best choice and I always go to Ebookee to fink my ebook of choice. Ebookee has a vast library of books just ready to be purchased, downloaded and listened to, perfect when I'm stuck in LA traffic. " "This site is for ebook downloads so if you are really looking for audiobooks just go to audiobook bay. This is a great place for ebooks though!" "Ugh I would not advise anyone to use Ebookee if you are like me who do not want to use websites where you can download stuff and must register first to fully enjoy the site. But if you are unlike me then feel free to use this one. " "This such a waste of my time. The selection is dire. Nobody seeds. Nobody seems to be uploading anything within the last few years at any great volume. It's okay if I want to read a book from ten or fifteen years ago, but for new stuff, I guess I'll just get out my wallet." "I was having a very hard time finding torrents for some obscure audio books I wanted but Ebookee had nearly all of them! It was very easy to use Ebookee to get the audiobooks I wanted and I was listening to them in no time." "This is great sharing site. It is broken down in many ways in order to find what I want to read." "No wonder this website is number in the list of torrent sites for downloading e-books. Perhaps, the best about this site is it won't require to you sign-up or log-in when you wanna download a certain e-book. 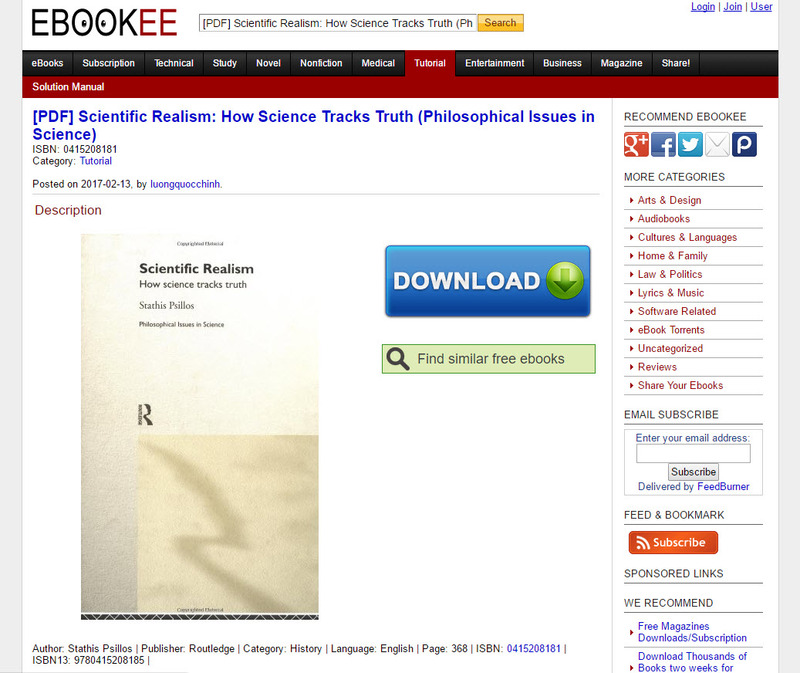 Secondly, it offers multiple mirrors link for downloading the ebook because some links might not work. Still, you will have other choices." 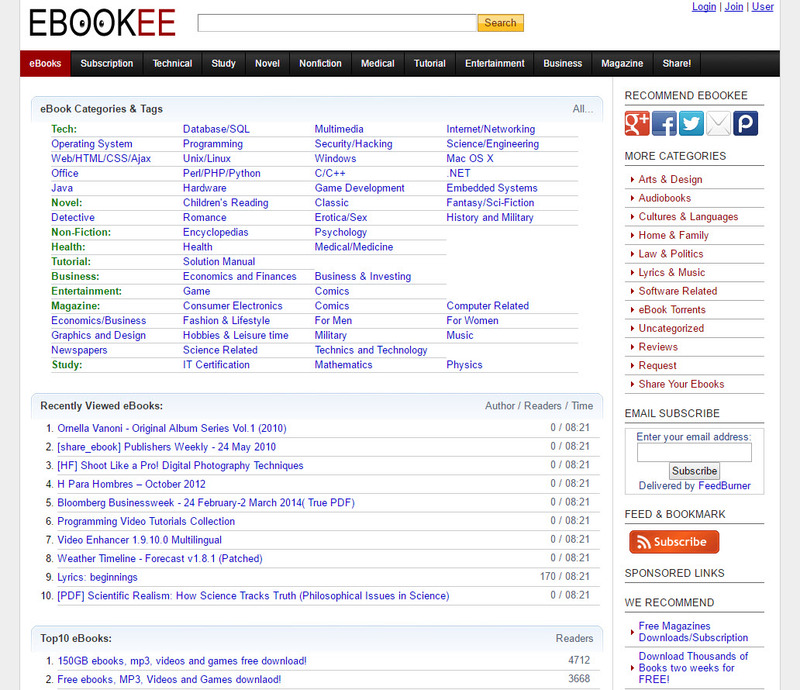 "I love using Ebookee for ebooks. Especially for comics. The layout on the site is so clean and easy to navigate exactly the category I'm looking for and they have Top 10 lists that I use when I want to read something I wouldn't normally read." "If I am looking for something good to read, Ebookee is the best torrent site I have used. There is always something new that I want to read next because I hate it when I dont know what I will read next. I highly recommend it!" "The layout of Ebookee is completely amateurish. It has a lot of useless features like how many posts other people have. Who cares?"